We do these caves so you don't have to. Another classic on the Marris Edwards tour itinerary. This was a visit to photograph the cave as it may be affected by the planned improvements on the A465 Heads of the Valleys Road. The cave runs from Blackrock Quarry, under the Blackrock Road and ends under the Heads of the Valleys dual carriageway. 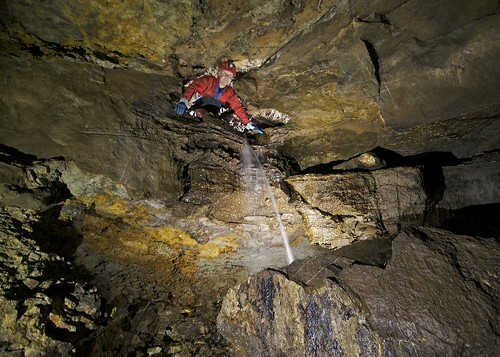 Only 100m of passage and most of this a sharp crawl that leads into a sizeable chamber. The highlight of the trip was the Meta Menardi spiders that inhabit the entrance passages. A short visit to Ogof Rhaeadr Ddu, a walk up the hill and an Ogof Lluigi through trip followed. Keith in Siambri Pen Y Mochyn Chamber.